A Finnish project will lead the way for the country’s supermarkets to climb aboard the renewable fuel circular economy. The grocery store chain Lidl and the energy company Gasum are cooperating to produce environmentally friendly and local biogas from biowaste generated at Lidl grocery stores. As part of their collaboration, Lidl will deliver its stores’ biowaste to biogas plants where they are used to produce environmentally friendly biogas – renewable and local energy that can be utilized in transport. ”Grocery stores can also implement the circular economy by producing renewable energy from biowaste generated by them. For example, when biowaste is used as a feedstock in biogas production, it can be recovered efficiently and used by the enterprise as energy in its operations,” says Jani Arala, Senior Manager, Sales, Road Fuels, from Gasum. 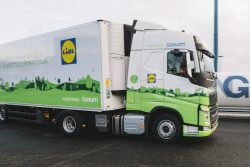 Lidl has also started using a truck powered by liquefied biogas that will be fueled by liquefied biogas (LBG) produced from Lidl stores’ own waste. ”The biogas-powered tractor unit is an excellent addition to our fleet: we’re able to deliver goods with low emissions and drivers appreciate the low noise level of the tractor unit. Based on our experiences so far, we may increase our gas-fueled stock quite rapidly,” says Eeva Virtanen, CEO, Antiokia Oy, the transport company that owns the vehicle running deliveries for Lidl. Using environmentally friendly biogas to fuel vehicles makes it possible to cut the greenhouse gas emissions generated over the fuel life cycle by up to 85% compared with traditional fuels. The LBG-powered truck will help Lidl reduce its emissions by an annual total of up to 193 tonnes. One tonne of CO2 emissions equates approximately to driving a diesel-fueled estate car for 7,500 km – the distance from Helsinki to Paris and back. 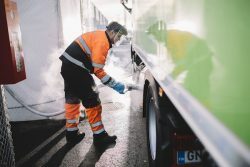 ”The new biogas truck is first used for grocery store deliveries from the Janakkala and later mainly from the Järvenpää distribution center. We’re happy to gain access to a new-generation low-emission transport fleet. This cooperation supports our investments in environmental friendliness and the efficient utilization of recycled fractions,” says Lidl Project Manager Anna Liitiäinen. Renewable biogas is produced from feedstocks including food waste generated in homes and retail outlets, sewage sludge and industrial by-products. Biogas production also represents the circular economy at its best as the organic matter created as a by-product can be utilized as environmentally friendly recycled nutrients by local farms. “Delivery and heavy-duty road vehicles are responsible for more than a quarter of road transport emissions in the EU. Depending on the size class, the annual emissions of a single tractor unit correspond to those of around 40–50 cars. LBG enables a major reduction in emissions. To achieve cuts in emissions from heavy-duty road transport, we need forerunners like Lidl,” Arala points out. Gasum is currently investing in the construction and opening of 50 new gas filling stations for heavy-duty vehicles in Finland, Sweden and Norway by the beginning of the 2020s. The stations will provide heavy-duty transport with support for mobility fueled by low-emission gas in the Nordic countries.